This entry was posted on mars 31, 2015 by HansHB. It was filed under Aktuelt, Arkitektur, art, bilde, Bygninger, Design, Foto, Fotoblogg, Fredda', Mandarin Orange Monday, Mat og drikke, MellowYellowMonday, Mennesker, Nikon, Nikon blog ambassador, Tull og tøys, Weekend Reflections and was tagged with AF-S Nikkor 24-70mm f2.8G ED, bilde, D4, Espresso, Espresso House, foto, fotografi, Fotosafari, fredda', fredda'n, Mandarin Orange Monday, Mom, nikkor, Nikon, Nikon D4, Norge, Norway, NSB, Oslo Sentralbanestasjon, railway, Railwaystation, Reflections, The Espresso House, Weekend Reflections, Weekly Top Shot. Jeg kan næsten smage kaffen, Hans 🙂 Dejligt billede. Artigt bilde Hans! !Hihihihi!må le av kommentaren din hos meg!! Beautiful photo, beautiful view, beautiful building! A lovely share! Quite a view through the window, very pretty. And a good espresso is hard to come by in train stations! Wonderful shot! I had to look twice to see that it was a reflection … a beautiful shot Hans … as for the coffee, I decided, this morning, that I needed to cut back on the caffeine … now I have a head ache … Hmmm. I love this coloured version!! Marvellous reflections. HAVE A HAPPY EASTER WEEKEND. Caféet ser så varmt och mysigt ut. Färgerna kontrasterar så fint mot den kallare omgivningen. Hi! Nice reflection! Your photo is very beautiful.Thanks for sharing. Wonderful photo – I would love to join you in an espresso! Happy Easter, Hans. A trendy, cool building. I’d like to pay a visit for a coffee. Yes, I like both versions, color and B & W! Pretty colorful place! Is it a coffee shop and bakery, too? Wonderful … But how the reflection is in the back at the train station?Also, Have a Happy Sunday of Easter! Kaffe må til. God påske. Well-composed and delightful to view! This one looks great in colour, I think I prefer it too the B&W. Great mood, lots to see, it’s warm and inviting. Well, it’s the effect coffee has on me, I suppose. 😉 Ha en fin uke! 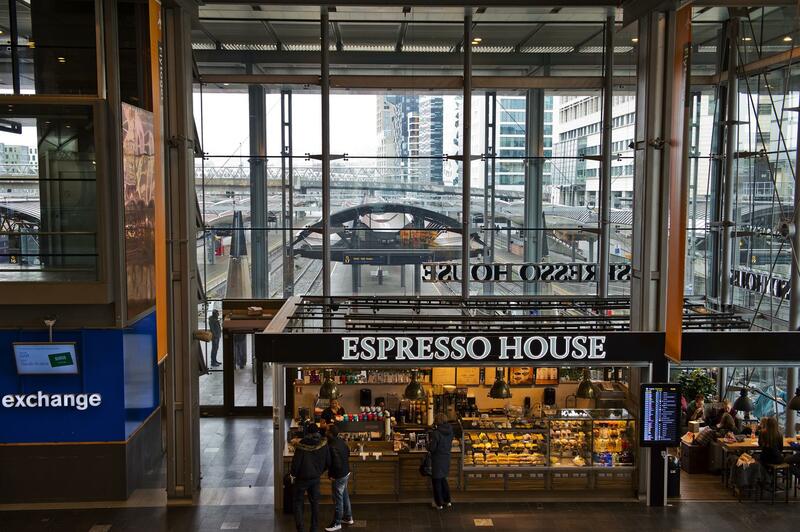 lovely photo- I would definitely like to visit espresso house! Hi! You photo is very cool. Thanks for sharing. Wonderful shot – love the unusual perspective. Ha ei god langhelg ! Love the several layers in this pic – which makes it almost look like several photos in one! Härlig bild med massor av fina färger.